If a person is missing a tooth or a couple of teeth, leaving those gaps is a bad idea, as it can change the overall alignment of your bite and create other problems. At Cosmetic Dentistry Center, we utilize two options for replacing teeth: dental implants and dental bridges. A series of implants may not be practical for some patients, so a dental bridge offers a good alternative to fill the gap and give the patient back his or her complete smile. As its name implies, a dental bridge “bridges” the gap created by a missing tooth or a couple missing teeth. Bridges are single-piece prosthetics consisting of two crowns atop the teeth on each side of the gap with a false tooth or teeth between them. The crowns serve as anchors. They are placed on the healthy teeth on each side of the gap, called the abutment teeth. A false tooth (pontic) is used to replace the missing tooth. The entire bridge is a single piece with porcelain fused to metal. It is fabricated in a dental lab to the patient’s specifications. Who is a good candidate for a bridge? Anyone missing a tooth or a couple teeth is a candidate for a bridge. Bridges can be placed quickly and are usually less expensive than a dental implant. As long as the two teeth on each side of the missing teeth are healthy, a dental bridge is a good solution to replace the tooth. Why do I need to replace the missing tooth anyway? People often don’t replace a missing tooth, especially if it’s a molar and not easily visible. They think this is saving them money and hassle, but leaving the gap is a bad idea for a number of reasons. Our teeth stay in place thanks to the pressure placed upon them by the adjacent teeth. When that pressure is gone because a tooth is missing, the adjacent teeth tend to slide over into the gap. This creates alignment and bite problems for the patient. There is another reason that can be even more damaging. When we bite and chew, a tremendous amount of bite force energy is created. This energy transfers through the teeth down through the roots into the jawbone beneath them. It is this energy that signals our jawbone to continually replace old bone cells with new cells; this keeps our jawbone healthy. When a tooth is missing, the jawbone no longer receives the energy in that spot and begins to deteriorate. That’s why people missing all or most of their teeth can appear as if their jaw is collapsing backwards. Basically it is. Placing a bridge with the team at Cosmetic Dentistry Center usually takes two appointments. During the first appointment, we prepare the abutment teeth for their crowns and take measurements for your bridge. To prepare the teeth, we shave off a portion of the healthy teeth on all sides and the top. This makes room for the crowns to sit atop the teeth, covering them all the way down to the gumline. Plus, it creates an excellent bonding surface. Next, we take precise impressions, along with photos, of your teeth. These are sent off to the dental lab for the creation of your custom bridge. That process takes two weeks. While it is being fabricated we place a temporary bridge on your prepared teeth. When your new bridge is delivered to our Newton offices, you return for your second appointment. We check the bridge for fit and color match with your adjacent teeth. At this point, we’ll place the bridge on your teeth and we’ll discuss the fit and how you feel about it. In some cases, we may place the bridge with temporary cement to allow you to test it out for a couple days of normal use. Once you’re satisfied with the fit, the bridge is permanently cemented onto your teeth and your smile is complete once again. You can use your bridge immediately. Traditional bridge — This is the bridge described above, consisting of two crowned abutment teeth with a false tooth or teeth between them. These are the most common bridges. We use porcelain for the crowns and the false tooth. Cantilever bridge — In cases where the missing tooth or teeth have adjacent teeth on only one side of the gap, a cantilever bridge is used. More like a balcony than a bridge, cantilever bridges crown two teeth on the one side to use as anchors. Maryland Bridge — Sometimes called “resin-bonded bridges,” Maryland bridges are used on the front teeth. These bridges don’t use crowns as anchors. Instead they attach bands to the back of the supporting teeth to anchor the resin that holds the false tooth or teeth in between. What is the lifespan of a bridge? Do they need special care? 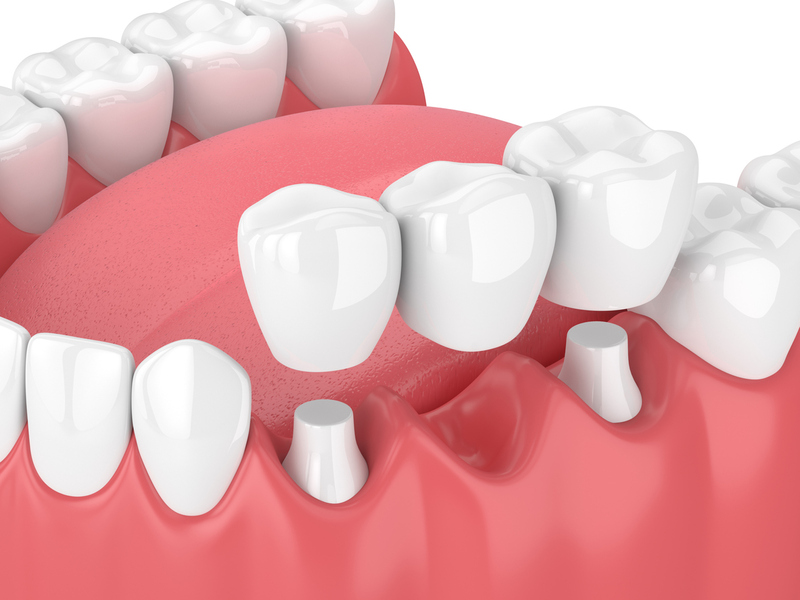 The lifespan of a bridge is usually dependent upon the health of the abutment teeth. If they remain healthy, a bridge can last up to 15 years or longer. Bridges can break and become damaged by hard or overly sticky foods. With that in mind, it can be smart to avoid eating some of those types of foods on the side of your mouth with the bridge. Do bridges need special cleaning? Bridges really only need brushing just like your other teeth. When you are flossing your other teeth you also need to floss under your bridge. That removes any pieces of food that may have worked their way under the bridge. What are the alternatives to bridges? If you’re missing a tooth or a couple teeth, a bridge is a good solution. But at Cosmetic Dentistry Center we believe dental implants are a superior option. Implants consist of a titanium anchor that is screwed down into the socket that held the natural tooth root. The jawbone then grows around and accepts the titanium implant over the course of a few months. Once that process is complete, a post is attached to the implant, and an artificial tooth is attached to that. Implants are a possibility for replacing a single tooth or even a few teeth. If you are missing more than just a couple teeth, an alternative is a partial denture. These can be anchored by implants. If you are interested in learning more about Dental Bridges, contact our office at 617-965-7673 to schedule a consultation today.